I discovered an interesting feature of Amazon EC2 Elastic Load Balancing today: you can add an EC2 instance to more than one ELB virtual appliance. Below I demonstrate the steps I took to set up two ELBs each containing the same instance, and afterward I explain how this technique can be used to deliver different classes of service. The result, showing the HTML It works! means Apache is accessible on the instance. elb-create-lb lbOne --availability-zones us-east-1a --listener "protocol=http,lb-port=80,instance-port=80"
elb-create-lb lbTwo --availability-zones us-east-1a --listener "protocol=http,lb-port=80,instance-port=80"
Both commands produce It works!, the same as when we accessed the instance directly. This shows that multiple ELBs can direct traffic to a single instance. Here are some of the things you might consider doing with this technique. Paid requests must be serviced within a certain minimum time. Non-paid requests must not require dedicated instances. Non-paid requests must not utilize more than a certain number (n) of available instances. To build a system that fulfills these requirements you can set up two ELBs, one for each class of service (and direct traffic appropriately). The paying-tier ELB contains n instances at first, and the free-tier ELB contains those very same n instances. You can then set up Auto Scaling for the paying-tier ELB, allowing it to scale based on average CPU or average latency across the paying-tier ELB. This would allow the paying-tier service to scale up and down with demand, but always leaving the original n instances in the paying-tier ELB pool, and always limiting the free-tier to using those n instances. And, all this is done without requiring separate instances for the free-tier ELB. different source ports to different destination ports (1 -> 1, 2 -> 2). elb-create-lb lbOne --availability-zones us-east-1a --listener "protocol=http,lb-port=80,instance-port=80" --listener "protocol=http,lb-port=80,instance-port=8080"
For more information and a full list of options, run "elb-create-lb --help"
Granted, the error message misidentifies the problem, but it will not work. Where does that leave us? The only potentially useful case for using two separate ELBs for multiple ports, with the same instance(s) behind the scenes, is where you want to split traffic from a single source port across different destination ports on the instance(s). Practically speaking, this might make sense as part of implementing different classes of service using the same instances. In any case, it would require differentiating the traffic by address (to direct it to the appropriate ELB), so the fact that the actual destination is on a different port is only mildly interesting. Putting the same instance behind multiple load balancers is a technique used with hardware load balancers to provide redundancy: in case one load balancer fails, the other is already in place and able to take over. However, EC2 Elastic Load Balancers are not dedicated hardware, and they may not fail independently of each other. I say “may not” because there is not much public information about how ELB is implemented, so nobody who is willing to talk knows how independent ELBs are of each other. Nevertheless, there seems to be no clear redundancy benefits from placing one EC2 instance into multiple ELBs. With Auto Scaling – Maybe, but why? This technique might be able to circumvent a limitation inherent in Auto Scaling groups: an instance may only belong to a single Auto Scaling group at a time. Because Auto Scaling groups can manage ELBs, you could theoretically add the same instance to both ELBs, and then create two Auto Scaling groups, one managing each ELB. Your instance will be in two Auto Scaling groups. Unfortunately you gain nothing from this: as mentioned above, Auto Scaling groups ignore instances that already existed in an ELB when the Auto Scaling group was created. So, it appears pointless to use this technique to circumvent the Auto Scaling limitation. 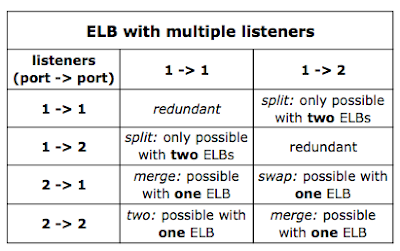 In short, the interesting feature of ELB allowing an instance to belong to more than one ELB at once has limited practical applicability, useful to implement different service classes using the same instances. If you encounter any other useful scenarios for this technique, please share them. Update 24 December 2009: You can use multiple ELBs with the same instances to provide multiple HTTPS sites on the same instance. Would you happen to know what algorithm the ELB uses behind the scenes ? Is is round-robin or is it smarter ? Thanks for this helpful post !! I have a question, is it possible for an instance to fetch the ELB values without AWS-CLI or APIS when an ELB is attached to it ? No. The only metadata available without API calls is instance-specific information.